Ever since the very first announcement of Doogee BL12000 the smartphone world has been anticipating the launch of this model and its BL12000 Pro sibling because, at least on paper, these are the smartphones with the largest batteries in the world - 12000 mAh, dethroning Oukitel and its models with 10000 mAh and 11000 mAh batteries. However, various teardowns of the BL12000 have shown that the battery capacity is 10000 mAh at best. The same should be applicable to the Pro variant as it has the same battery setup. 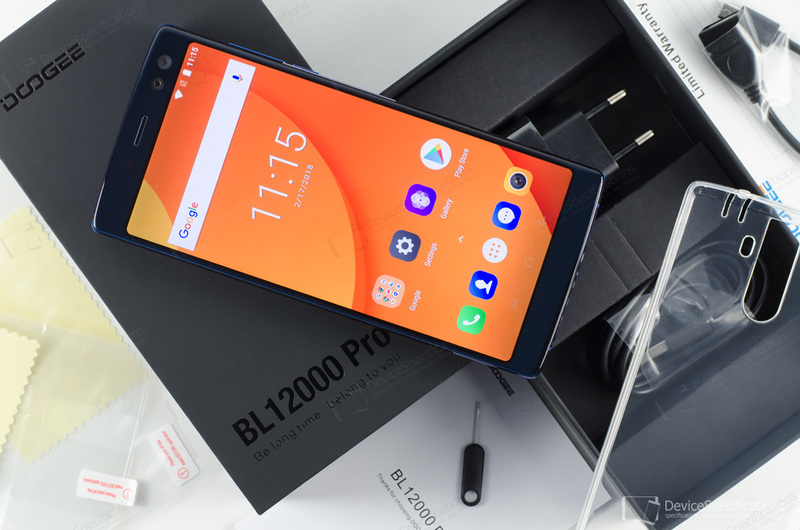 However, BL12000 Pro is based on a Helio P23 chipset which is way more power efficient than the MT6750T chipset that powers the BL12000, so a better battery life for the Pro is expected nevertheless. In the Battery section of this review, we address this issue. The camera department of BL12000 Pro also sounds interesting as it includes two front and two rear shooters, the front offering face recognition and unlocking along with a 130-degree lens for group selfies (the same one is found on the Doogee Mix 2). All in all, this model has lots of aspects that make it attractive and we check each and every one of them. You can buy Doogee BL12000 Pro at a promotional price from here or here. Doogee BL12000 Pro is equipped with a 6-inch IPS display with an FHD+ resolution (1080 x 2160 pixels) and a 2.5D curved glass. According to the official specifications, the model is equipped with two 6000 mAh batteries that are joined together and provide a total capacity of 12000 mAh. The device arrives with a 5V~7V~9V~12V/3A fast charger. The combination of a large battery and the MediaTek Helio P23 (MT6763) chipset that ticks under the model's hood promises impressive battery life. This system-on-chip uses TSMC's 16nm process and employs an octa-core CPU with four 2.34GHz Cortex-A53 cores and another four of those ticking at 1.75GHz. A dual-core 770MHz Mali-G71 MP2 GPU with Vulkan support manages the graphics department. The model features 6GB of dual-channel LPDDR4X RAM clocked at 1600MHz and either 64GB or 128GB of eMMC 5.1 internal memory. Either way, it can be expanded with up to 256GB. The model supports 2G GSM (850, 900, 1800, 1900 MHz), 3G WCDMA (900, 2100 MHz), and 4G LTE-FDD (800, 900, 1800, 2100, 2600 MHz) network bands with LTE Cat. 7 speeds. The wireless connectivity options include dual-band Wi-Fi 802.11 a/b/g/n, Wi-Fi Hotspot, Wi-Fi Direct, Wi-Fi Display, and Bluetooth 4.0. 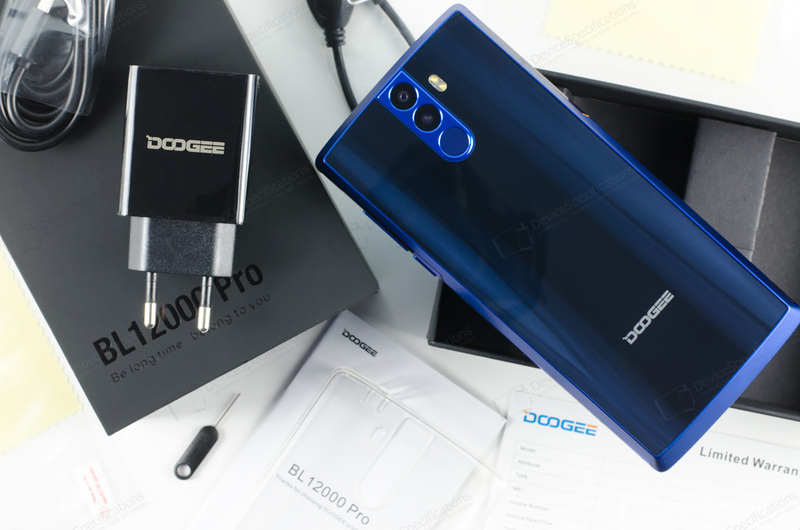 Doogee BL12000 Pro features two rear and two front cameras. The rear dual module includes a 16MP OmniVision OV16880 sensor with an f/2.0 lens and a VGA GalaxyCore GC03010 snapper interpolated to 13MP that is used only with the Blur mode. The front cameras are two independent shooters. The first packs a 16MP OmniVision OV16880 sensor and an 88-degree lens with face recognition. The second is equipped with an 8MP OmniVision OV8856 sensor and 130-degree wide-angle lens for group selfies. The device also has a 3.5 mm jack, a MicroUSB 2.0 port with OTG support, a rear-mounted fingerprint sensor. It supports GPS and GLONASS and runs on Android 7.1.1 Nougat with Doogee OS 2.0 on top. Complete Doogee BL12000 Pro specifications.